The opportunity cost of mortgage interest. The opportunity cost of lost time off from work. The money-saving Grow Slow, Pay As You Go method of home buying. Enter the dollar amount of the home loan (principal amount), but without the dollar sign or any commas. Optional: If you would like the monthly house payment calculator to calculate the number of hours you will have to work just to pay the mortgage interest charges, enter your real hourly wage in this field. Clicking on the link will open the Real Hourly Wage Calculator in a new window. Schedule?Include schedule?Include amortization schedule?Include amortization schedule? Based on your entries, this how much your monthly house payment will be. This does not include property tax or insurance payments. Based on your entries, this is the total of all of your monthly house payments. Based on your entries, this is how much interest you will pay between now and when you finish the home loan repayment. Based on your entries, this is how many hours you will need to allocate to working in order to pay just the mortgage interest charges. This does not include all of the hours you will need to work to pay for the down payment, principal, and all of the upfront and ongoing costs that come with buying and owning a home. Based on your entries, this is how many 40-hour work weeks it will take you to just to pay the mortgage interest charges. Again, this does not include all of the 40-hour work weeks it will take you to pay for the down payment, principal, and all of the upfront and ongoing costs that come with buying and owning a home. This free online calculator will calculate the monthly payment and total interest cost associated to a home loan repayment. Plus, unlike other online financial mortgage calculators, this calculator will also calculate the number of hours you will need to allocate to working in order to repay the home loan's principal and interest. If you would like to calculate a house payment that includes principal, interest, tax, insurance, and PMI, please visit the PITI Mortgage Calculator. Enter the annual financing rate of the house loan. If you want to discover how many hours you will need to allocate to working in order to pay the finance charges, enter your Real Hourly Wage. Otherwise leave blank. Tap the "Calculate House Payment" button and scroll down to view the results. This is the breakdown of each periodic payment made to repay the amount borrowed. Each line of the amortization schedule shows the total amount paid for the period, along with the portion that went to pay down the principal and the amount that was used to pay the current period interest charges. The last column is the new balance owed following that period's payment (previous balance minus principal portion of current payment). The calculator allows you to choose whether or not you want the results to include a monthly amortization, an annual amortization, or no amortization schedule at all. Using the house acquisition method that minimizes mortgage interest opportunity costs. In case you're not familiar with the term, opportunity cost refers to the value of what you give up when choosing one course of action over all other alternative courses of action. As it applies to money, if you spend a given amount of money to purchase something that loses its value with time and use, you simultaneously give up the right spend that money on anything else of equal or lesser value. In the case of taking out a home loan to purchase a house, one of the things you will be spending money on is interest charges. And while the house may grow in value over time (pure speculation), the money you pay out for interest charges represents a value that is lost forever. 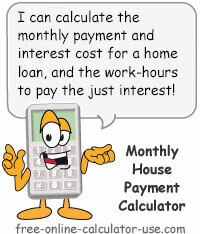 In order to determine the opportunity cost of the interest charges you will pay on a home loan, you first need to determine how much these interest charges will add up to over the course of the home loan repayment term (the monthly house payment calculator on this page will help you to do just that). Once you have totaled up the home mortgage interest charges, the next step is to ask yourself, "What else could I spend that money on if I chose not to borrow money to purchase a home?" If you're like most people who ask themselves this question, one of the answers that may not have occurred to you is, "time off from work." Every dollar you spend on home loan interest charges is money that could have been used to meet your other financial obligations. This means that if your cost of living averages out to $100 per day, then every $100 you spend on interest charges represents one day that you could have taken off from work had you paid cash for a home rather than borrowed the money to purchase it. The monthly house payment calculator on this page will estimate how many 40-hour work weeks it will take you just to pay the interest charges on your home loan. Sure, we all need somewhere to live. But we do have a choice as to whether we satisfy that need with a $30,000 mobile home or with a $3,000,000 ocean-front mansion. Unfortunately most of us have been brainwashed into believing that we are entitled to the instant gratification we can get from purchasing a home without having to pay cash for it up front. And the reason no one is trying to convince us to do otherwise is because no one stands to get rich from promoting the concept of saving up and paying cash for the things we desire. In fact, the reason you won't likely find another monthly house payment calculator on the web that calculates the opportunity cost of taking out a home mortgage is because all of the other calculators are created for mortgage and real estate companies. And the last thing they want you to do is to become aware of the drawbacks to following their advice. I know this may be difficult for you to comprehend, but it is possible to purchase a home with cash -- thereby preserving a mountain of your free time for other things besides working to pay the interest on your mortgage. It's called the "Grow Slow, Pay As You Go" method of purchasing a home. Rent or buy the smallest, most inexpensive mobile home, house or apartment that you can exist in. Estimate the size of the mortgage you could qualify for based on what the mortgage companies are telling you. Each month deposit the difference between your monthly rent or house payment and what the mortgage companies say you can afford to be paying each month. Also include any money you will save in home ownership costs (insurance, utilities, maintenance, repairs, property taxes, etc.) from buying or renting a much smaller residence. Once your savings has grown to the point that you can afford to pay cash for a larger residence, pay cash for the larger residence but continue to deposit the previous amount into your home buying savings account. Repeat step #4 as often as you deem necessary. If you follow the Grow Slow, Pay As You Go home buying method, three things will happen. First, you will fully appreciate every dwelling upgrade. After all, you can't fully appreciate a larger living space until you've live in a cramped living space. Nor can you fully appreciate a free standing home unless you've lived in a thin-walled apartment surrounded by other apartments. The second thing that will happen, is that over time you will be able to afford twice the house you could have afforded if you had bought into the instant gratification home buying plan promoted by real estate and mortgage companies. This is due to all of the interest you will earn on the invested mortgage payments you won't have to make, combined with all of the mortgage interest charges you will save by not having a mortgage. And finally, the third thing that will happen is that at some point you can choose to stop buying larger homes and instead simply use your investments to supplement your income -- meaning you can take more time off from work to spend time doing things that are most important to you. If you opt for the popular instant gratification home buying plan (Grow Fast, Pay Later), all of the interest charges you will pay will only insure that the top executives of your home's mortgage company will have more time to do what is important to them.